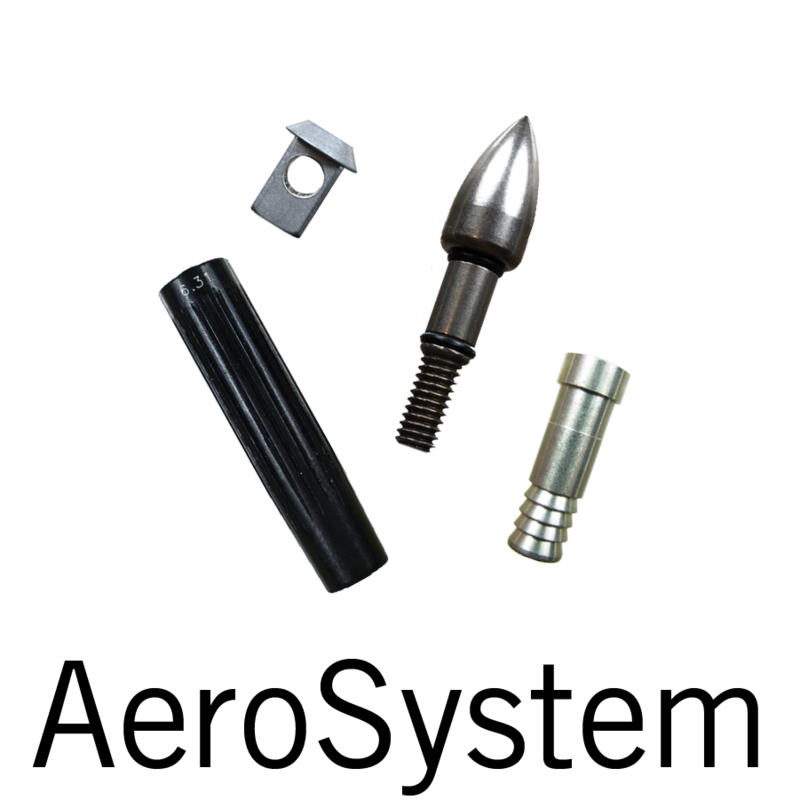 Firenock AeroComponents are equipped with multiple Firenock US patented technologies to give you outstanding performance in terms of durability, accuracy, and functionality. Our over one hundred components for practically all shaft sizes are organized into two lines: the AeroSystem and the AeroConcept System. While the AeroSystem is our take on the traditional for any hunter or competitor, the AeroConcept System is a more involved but revolutionary system that utilizes what we call Carbon Inner Tubes (CTI). Begin by selecting a line below or explore our component categories individually by clicking one of the lower, smaller icons. Note that the AeroSystem components cover a large range of sizes. See the size charts on each page for more details. Note that only certain sizes (i.e. 0.202”, 0.246”, 0.300”, 0.315”) are compatible with the AeroConcept System. The AeroConcept System (ACS) involves four elements, three of which are familiar to most—an arrow shaft, an insert, and a point (see diagram above). The last element of the ACS, unique to Firneock is a “Carbon Inner Tube” (CTI). This tube, as suggested, is made of carbon and intended to sit within an arrow shaft. Note that this means that only certain sizes (i.e. 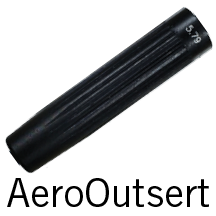 0.202”, 0.246”, 0.300”, 0.315”) are compatible with the AeroConcept System. Specifically, CTI is designed for installation with an AeroInsert-H, creating one large insert unit. The question still remains however, why include this Carbon Inner Tube? Well, the AeroConcept System, via this extra element, will not only strengthen your arrow’s front end, but also gives your arrow a variable spine (i.e. spine at the front and at the back are different). These effects’ cause is obvious. By adding—i.e. gluing with the intention of melding—a new, smaller carbon tube into your shaft, the overall wall thickness increases at the front, stiffening and generally reinforcing it. The reason why a variable spine matters is a bit trickier. To explain, first recall the oscillation cycle of a standard arrow from the AeroFlight 101 spread. Now, realize that due to the additon of the CTI, the spine is higher near the front than everywhere else. This distinction means that the radius of that oscillation is shortened significantly. And due to that shorter radius, the cycle of oscillation is dampened—in fact, harmonically dampened (US Patent # 9395166). Your arrow stops flexing significantly faster and thus begins flying flat faster. With your arrow equipped with the AeroConcept System and Aerovane II or III, it can even enter a gyro spin. Additionally, an aftereffect of the AeroConcept System is how it extends a node into something we call a “null zone” (marked above in red). This shift allows for more arrow forgiveness since there’s an actual entire area to accurately postion your arrow rest at pull back instead of a singular point. Learn more about why this matters from the AeroFlight 101 spread. The AeroConcept System 2.0 (ACS2), introduced in 2018, involves all four elements of the ACS but with the supplement of another Carbon Inner Tube at the back of an arrow behind the nock or Firenock lighted nock system (US Patent # 9982975). To understand the benefits of the ACS2, just imagine those of the ACS and then amplify them by 30-40%. The aforementioned radius of oscillation is even smaller, allowing for further energy retention. An arrow equipped with ACS2 will fly yet flatter and therefore a higher POI (point of impact).